Globalization, post-colonial identities, and Islam inform and complicate pop music in Indonesia, a Southeast Asian nation increasingly important on the global scene. The current issue of Asian Music—“Constructing Genre in Indonesian Popular Music: From Colonized Archipelago to Contemporary World Stage” 44(2) available in July 2013—examines commercial music from this island nation. The set of seven studies considers how current directions reflect and inform cultural flows that are both regional and global, referencing colonial and post-colonial historical events. Topics include kroncong, dangdut, campur sari, fusion musics, and indie bands in Bali and Java. One study concerns the global reach of the fusion band Krakatau. The authors are known area specialists, including David Harnish, Brent Luvaas, Rebekah Moore, R. Anderson Sutton, Andrew Weintraub, and Philip Yampolsky. The issue is co-edited by Jeremy Wallach and Esther Clinton. 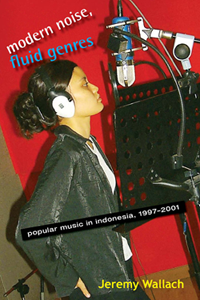 By focusing upon the single nation of Indonesia and the single medium of pop music, this issue of Asian Music provides a cogent frame with cohesive content useful for any study of an area-defined pop culture and its dynamics of commercialization, domestication, hybridization, mediatization, decolonization, and regionalism. The single issue 44(2) can be ordered at a cost of US$23 within the US, US$31 in Canada, and US$36 international. Annual subscription for Volume 44 (2013) includes two issues. For information on ordering see http://utpress.utexas.edu/index.php/journals/asian-music. The Society for Asian Music is an ethnomusicology organization devoted to the appreciation, study, and research of the diverse musics of Asia. Asian Music is its journal. The Society provides small grants for student researchers. For more information about the Society see http://asianmusic.skidmore.edu/. Sebuah penerbit buku akademis yang prestisius di Indonesia, Komunitas Bambu, telah membeli hak untuk menerbitkan versi Bahasa Indonesia dari Modern Noise Fluid Genres. Tanggal terbit akan diumumkan di website ini. SAVE THE BGSU POPULAR CULTURE HOUSE! Help prevent the beloved, historic home of the BGSU Department of Popular Culture from becoming the next casualty of administrative arrogance and vulture gentrification. “Kadang saya berharap dia salah mengeja atau salah memahami inside jokes misalnya tentang skena musik di Jakarta. Namun saya tidak pernah menemukan kesalahan itu di buku ini” (at times I hoped he would make a spelling error or misunderstand an inside joke, for example about the Jakarta underground scene, though I never did encounter any such mistakes in the book). I’m proud to say Modern Noise, Fluid Genres is part of the same book series as Roosa’s book. This is from the University of Wisconsin Press November 2010 newsletter. The Indonesian Institute for Social History (Roosa’s Indonesian-language publisher) challenged the attorney general in the Constitutional Court, Indonesia’s supreme court. The UW Press contributed a letter of support crafted by series editor Alfred McCoy and Press director Sheila Leary, emphasizing the scholarly credentials of the book and the author. 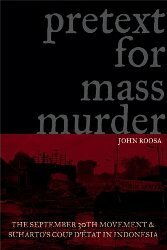 Pretext for Mass Murder had recently been a finalist for a book award from the International Convention of Asian Scholars. In the verdict, the court took away the powers of the Attorney General’s Office to unilaterally ban books, saying such power should rest with a judicial court. See the UPI stories on the court case. Roosa’s book was the first title published in the University of Wisconsin Press series ” New Perspectives in Southeast Asian Studies,” which we began publishing in 2006 in collaboration with the Center for Southeast Asian Studies at UW–Madison. The series is wide-ranging, welcoming authors from around the world, writing in varied disciplines and genres, and looking at cultural, economic, environmental, political, and social issues. Eight titles have been published so far. The next two books in the series are The Floracrats: State-Sponsored Science and the Failure of the Enlightenment in Indonesia by Andrew Goss of the University of New Orleans, due in February 2011, and Revolution Interrupted: Farmers, Students, Law, and Violence in Thailand by Tyrell Haberkorn of Australian National Unversity, due in March 2011. One important goal of the series is to bring this research to readers in Southeast Asia. In addition to UW Press’s efforts to sell English-language print and e-book editions worldwide, we have also licensed translation rights or sales territories for books in the series to such publishers as Silkworm Books in Thailand, Ateneo de Manila in the Philippines, the National University of Singapore Press, and the Indonesian Institute for Social History. Modern Noise Fluid Genres has been added to the University of Wisconsin Press’s recent relaunch of its Popular Press imprint. Click here for more info. Digital download version of Modern Noise Fluid Genres now available here! You now can preview Modern Noise Fluid Genres in Google Books here. Jeremy will be signing books at Grounds for Thought coffee house (174 South Main Street, Bowling Green, OH) next Friday, December 12th at 5:00 PM. For more information please contact Grounds for Thought at (419) 354-3266.